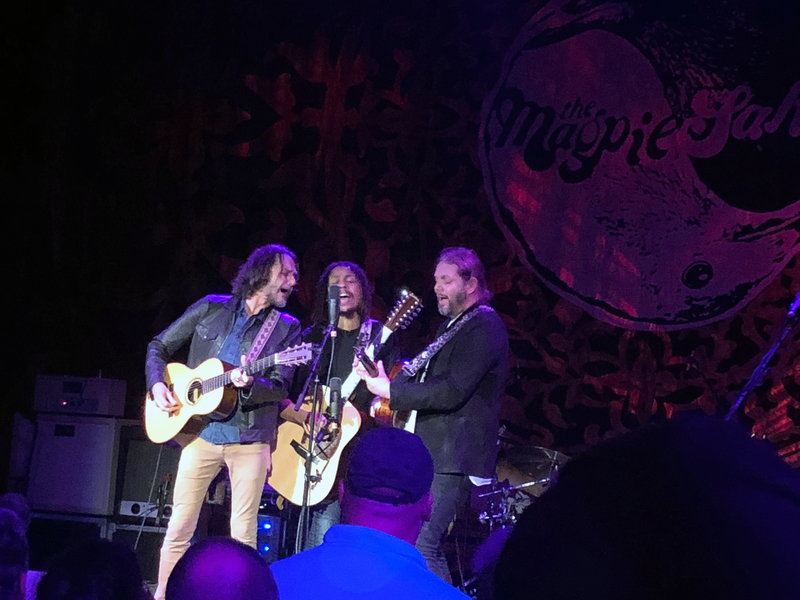 The trio of John Hogg, Rich Robinson and Marc Ford opened up the first of the two shows by the Magpie Salute that I’d see — all three with guitars and all three locking their voices together. 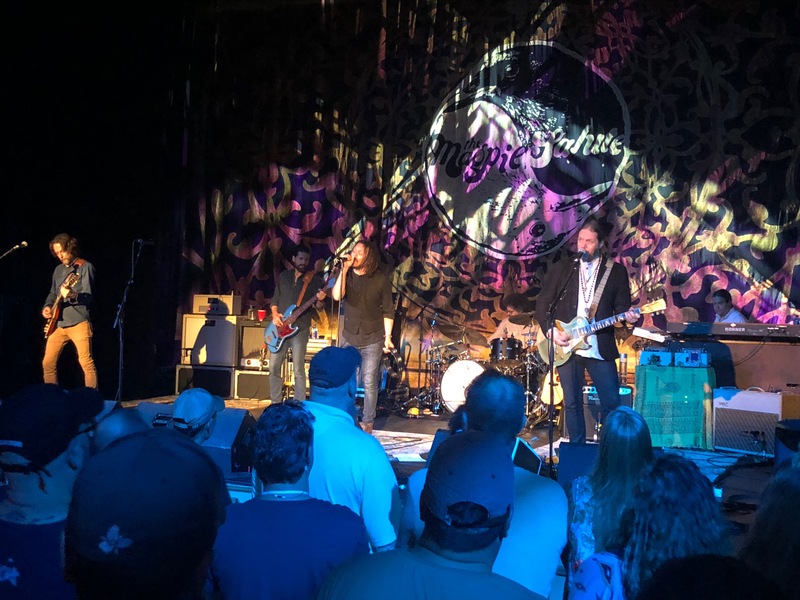 From there on a Friday and Saturday night, they moved through their own new material, songs from their past and tunes from some heroes that laid the groundwork for all this. In a little more than two hours each night, that trio — by themselves and augmented by the rest of the band, covered a tremendous amount of territory. Acoustic sets, electric explosions, delicate harmonies, powerhouse vocals. 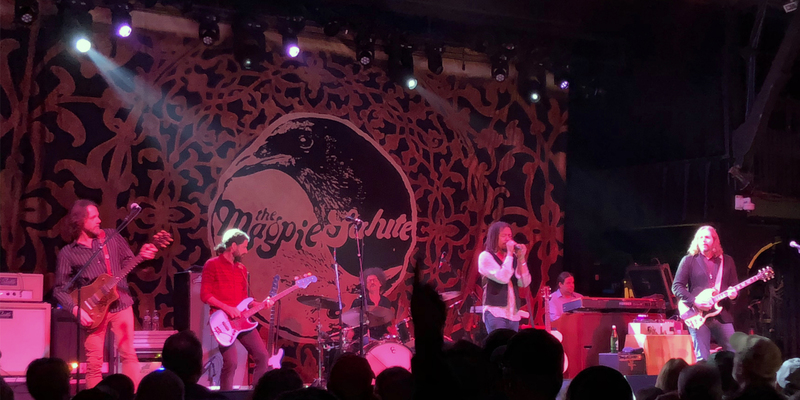 Across two shows in two venues less than 40 miles apart, the Magpie Salute dipped into the past when necessary, but all in service to taking their sound into the future. The show at the Cabot in Beverly, Mass., practically served as a Curriculum Vitae for the band when they called an audible and decided to split the show into acoustic and electric segments. 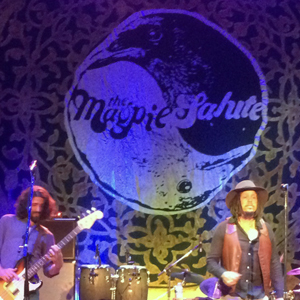 The electric half opened with the riff-heavy blast of “Mary the Gypsy” and quickly veered into several sidetracks. Ford’s Crazy Horse-heavy stomp of “The Vulture” soon gave way to a breathtaking reading on Neil Young’s “Big Time,” with Robinson on lead vocals, but Hogg, Ford and bassist Sven Pipien all joining in on its chiming chorus. We got another taste of Hogg’s versatility during Bob Dylan’s “Ballad of a Thin Man” when he sat next Matt Slocum and supported him on piano while Slocum manned the organ while Robinson gave his own inspired take on the lyrics. The acoustic set showed showed their chops absent the crunching volume, and how natural they appear in that setting. They breathed new life into “You Don’t Have to Cry,” a Crosby, Stills & Nash song that worked as a showcase for the main trio’s vocal harmonies. Hogg put his vocal talents on display in an emotional reading on Otis Redding’s “That’s What My Heart Needs,” and the band showed their country side on their own “Hand in Hand” and a cover of the Flying Burrito Bros.’ “Hot Burrito #2,” led by Robinson. The following evening at the Hampton Beach Casino Ballroom in New Hampshire acted as likely a more representative sample of this band on any given night. Again, they changed up the setlist — nine of the first 10 songs hadn’t appeared in Beverly — and that guitar telepathy was never more clear than on “Laila II” — Robinson and Ford were absolutely locked onto those dueling harmonies during an instrumental that was as tight as it was spacey. Ford’s leads are the stuff that can breed obsession, and every time out, it’s evident why that is. Tasteful enough to not showboat, he nevertheless slays every solo he attempts. And like Robinson, he was visibly enjoying himself, each of them smiling as they called out cues and reacted to the rest of the band. But on this night, Hogg was center stage as he strutted through the Magpies’ original material. “Omission” is practically a standard for the band at this point, and “Open Up” offered the chance for the group to display their vocal harmonies again, this time in an electric setting. Where Robinson did most of the speaking for the band in the past year, and again in Beverly, in Hampton it was Hogg greeting the audience and cracking jokes between songs. And he’s clearly much more comfortable than he was a year ago. Any doubts as to his credentials that may have existed are gone, and he’s obviously been embraced by the audience. He’d stalk the stage, turning his back and sing directly to drummer Joe Magistro, himself smiling behind the kit, or again to Slocum over his stable of keys. He’s taking vocal liberties with the melodies and delivery on some of the Black Crowes material, and it all felt as natural as their souped-up reading on Blind Faith’s “Had to Cry Today.” Those songs were all warmly welcomed by both crowds, but the fact that there was so few of them on either night — and that it hardly mattered — speaks volumes to the lasting impact this band is already creating. But the most vivid image from the two shows was burned in immediately as the trio of Hogg, Robinson and Ford took the stage in Beverly. Each armed with a guitar, they took their places around a single microphone and started in on “High Water” to open the festivities. Robinson hammered on the open-chord bass notes, Ford focused on his intricate fills and Hogg, stepped slightly back in the center, tilted the neck of his guitar vertical and away from Robinson to all fit in around the single mic setup. And on the choruses, they all sang with force — the guitarists supporting Hogg’s lead. It was an illustration on not just where this can go, but how powerful they are stripped to the bare frame, and how they can apparently go wherever they want just by working together. 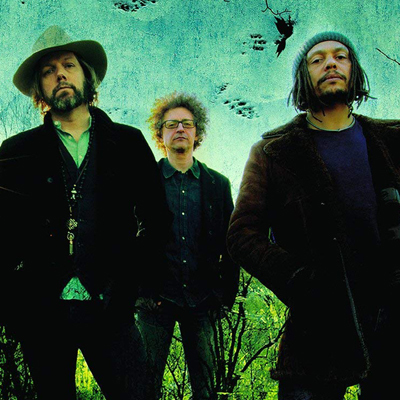 In fewer than 40 miles, they seemed to travel every path of their musical spectrum, and with all of them joining forces, it made it seem as though they weren’t even trying.